My last geological fieldwork (if we can call it that) in Israel on this trip was to examine the Upper Cretaceous limestones and dolomites exposed in Jerusalem. I far prefer my rocks be found in pristine wilderness areas with only bird songs in the background, but the right rocks, of course, can be anywhere. Sometimes, then, we have to work with traffic zooming by, sirens wailing, blasts of car exhaust, and schoolchildren offering to hammer the rocks for us. The coolest location was in the moshav of Beit Zeit, just five minutes from downtown Jerusalem. (A moshav is a type of cooperative agricultural community, although in this case heavily urbanized.) A beautiful trackway of ornithomimosaur dinosaur footprints is exposed on a bedding plane of Lower Cenomanian limestone. 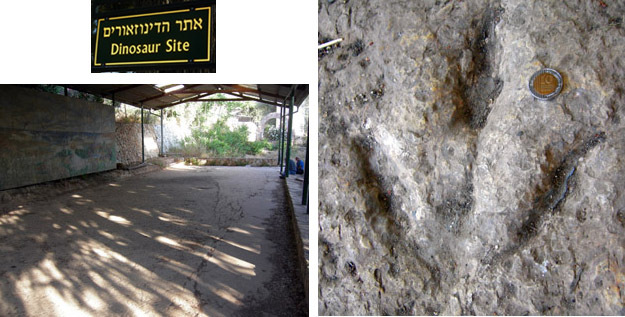 The site is of great importance because thus far these are the only dinosaur tracks known in the entire Middle East. The local community purchased the land and erected a protective roof over the trackways. They had a mural painted showing what the area may have looked like in the Cretaceous, installed a custom-made life-size dinosaur model on the bedding plane, and made the area into an educational park. You can see for yourself what happened later. The surrounding fence was too low, so it became a drug hangout, vandals spray-painted the mural and then broke the dinosaur into bits. (The crater where the dinosaur stood is just visible in the photo.) This natural wonder was simply too accessible to the public. There are plans to protect the site more thoroughly, and then reconstruct the displays. I was able to collect a small piece of the limestone bedding plane for analysis back in Wooster. My hypothesis is that the limestone is a marine hardground which cemented very soon after the dinosaurs waded across it, thereby preserving the prints. A thin-section of the rock may show if it had these early cements. 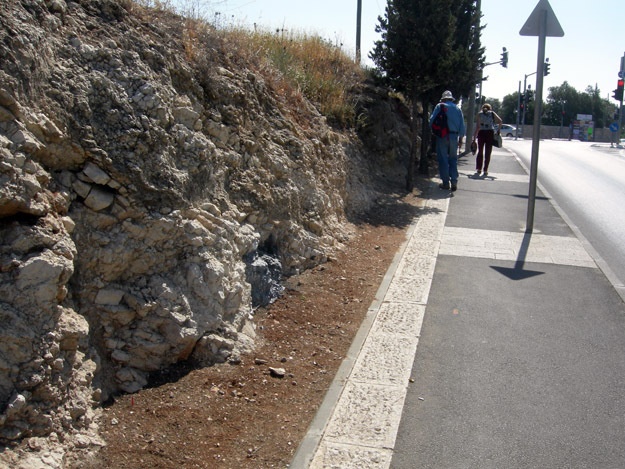 The rest of our urban geological work was on the streets of Jerusalem. Rocky outcrops are common because the city is built on several steep hills which have been quarried for thousands of years. 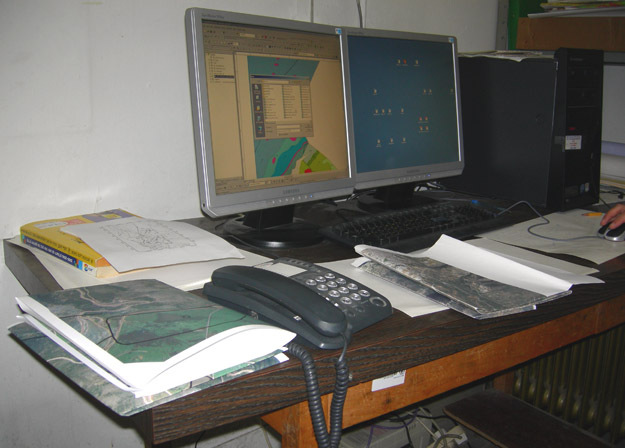 We were able to correct the geological map in some places because of new exposures, and I gathered several ideas for future projects. Mizzi hilu ("sweet rock"), a lithographic biomicrite member of the Judea Group (Turonian). 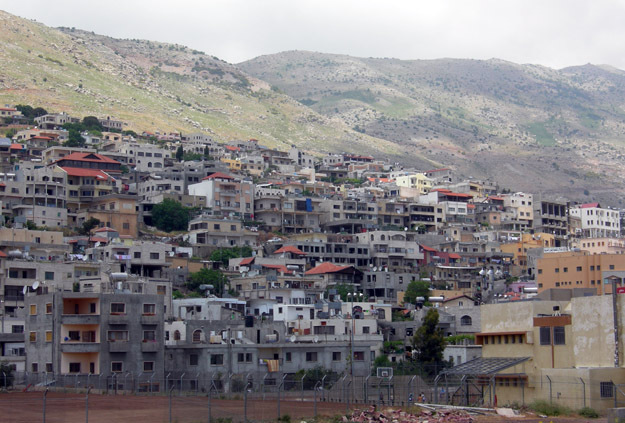 Part of Majdal Shams seen from the town center and facing Mount Hermon. One of the cultivated valleys near Majdal Shams. Our goal today was to examine three marine Jurassic formations (from bottom to top in the geological fashion): the Zohar (mostly limestone), Kidod (mostly shale), and Beersheva (mostly limestone). I had two primary questions: What indications can we find in these rocks of the water depth when they were deposited? What was the intensity of bioerosion of the corals and sponges in these units? Both questions are part of larger studies placing these rocks in context with the rest of the known Jurassic world. This region was on the equator when these units were formed, so we have an unusual opportunity to study Jurassic equatorial ecological conditions. As is often the case in paleontology, we found some of the best fossils at the boundaries between formations. The top of the Zohar and bottom of the Kidod have wonderful ammonites, belemnites, bivalves, and brachiopods, some appearing to show patterns of microbioerosion. The top of the Beersheva has massive corals and sponges which are thoroughly bored by bivalves, some of which are still in the crypts they excavated for themselves. 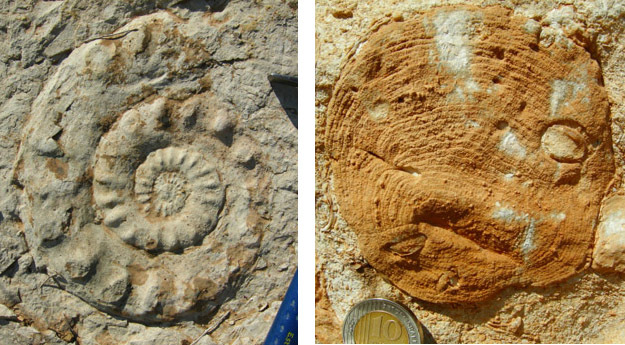 On the left is a very large ammonite we found in the top of the Zohar Formation. Note the hammer for scale. 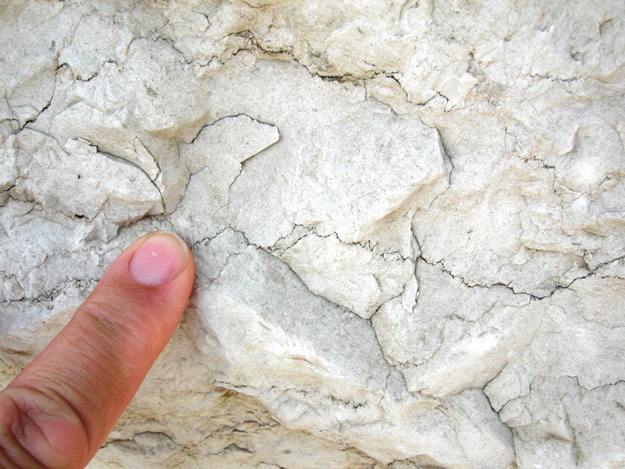 On the right is a closer view of a partially silicified coral from the top of the Beersheva with holes drilled in it by bivalves, some of which are still in place. All the indications we could find showed that the limestone units were clearly shallow water deposits. The thick shales of the Kidod were laid down in deeper waters well below wave base. Much more work is required, though, before we can come to any conclusions. This is a reconnaissance trip to sort out potential projects for Wooster Senior Independent Study students and my own research. I now see many opportunities here. Our faculty colleagues on the Hales Fund trip to China have posted on their blog a wonderful photographic blog essay of their encounter with the Great Wall of China. It gives me an excuse to show some cool walls I’ve encountered lately on this trip. All of these structures are made from one of the limestone varieties of Jerusalem Stone. 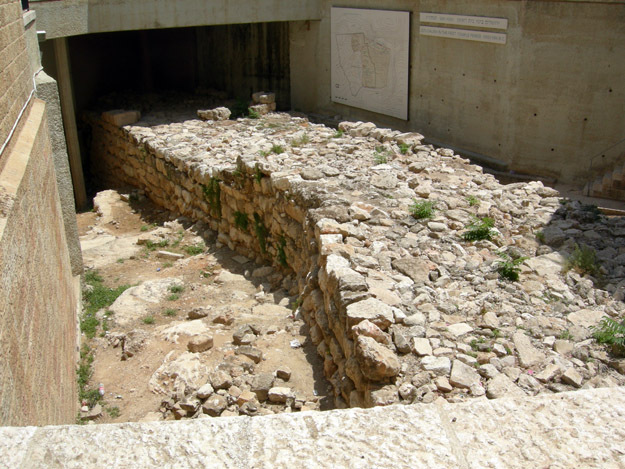 Southeast corner of the retaining wall for the Temple Mount. The massive lower blocks were carved and emplaced during the reign of King Herod the Great (37 - 4 BCE). 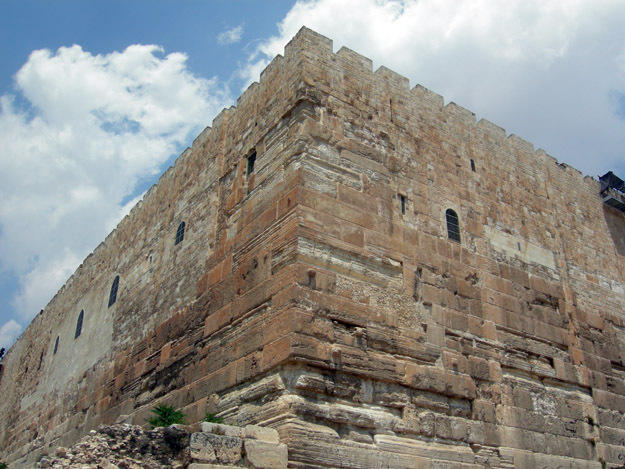 Golden Gate (Bab el-Rahma) in the eastern city wall, another construction during Herod the Great's reign. 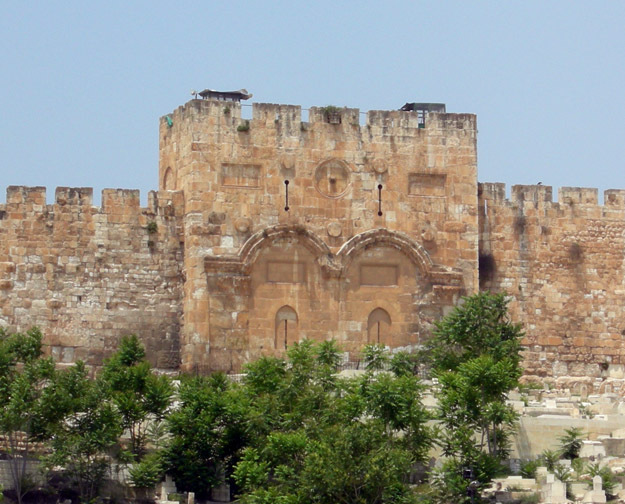 Jewish tradition is that the Messiah will pass through this gate into Jerusalem. Possibly for that reason the Muslim rulers in the 7th Century closed it up and placed a graveyard in front of it. Middle of the north city wall. This is the side of the walled city most vulnerable to invaders, so the height of the wall was enhanced by quarrying out the limestone beneath it. 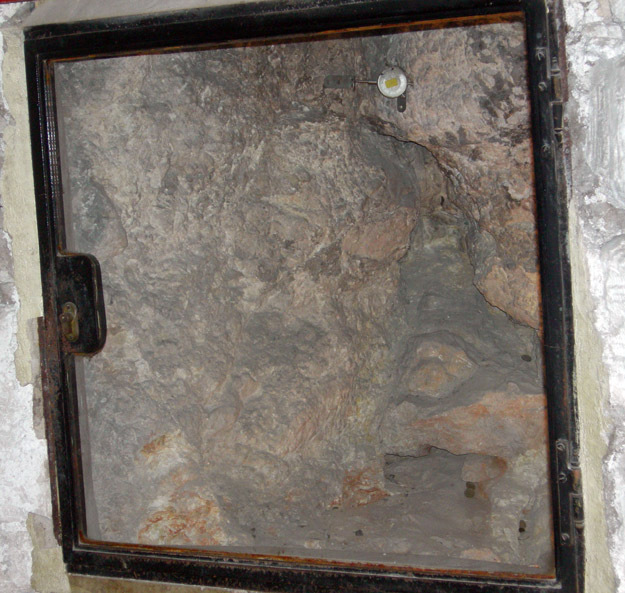 The door leads into one of many subsurface quarries underneath this part of the Old City. 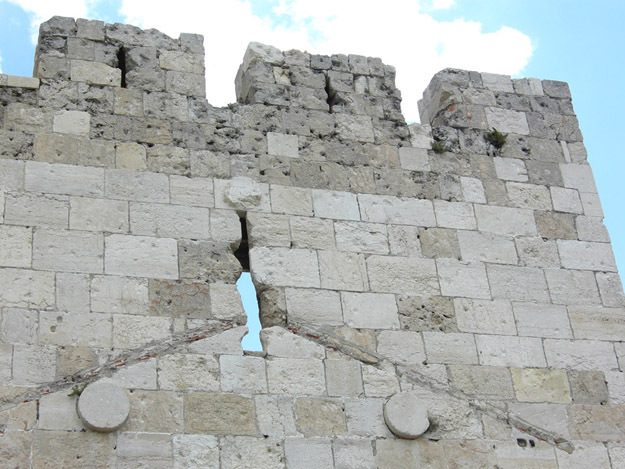 The stones atop Jaffa Gate on the western side of the city walls show bullet and shell scarring from the 1948 War of Independence. Jordanian troops held the Old City and the Israelis were desperate to relieve the Jewish Quarter inside. A bit of limestone wall exposed in the Chapel of Adam inside the Church of the Holy Sepulchre. Christian tradition is that this is the burial place of Adam, which was supposed to be directly below the crucifixion site of Golgotha. The crack you see in the rock was believed by early Christians to have been formed during the earthquake upon the death of Jesus. Archaeologists suggest that it was a pre-existing crack in an old quarry. What I found interesting was that someone has placed a strain meter across the crack! 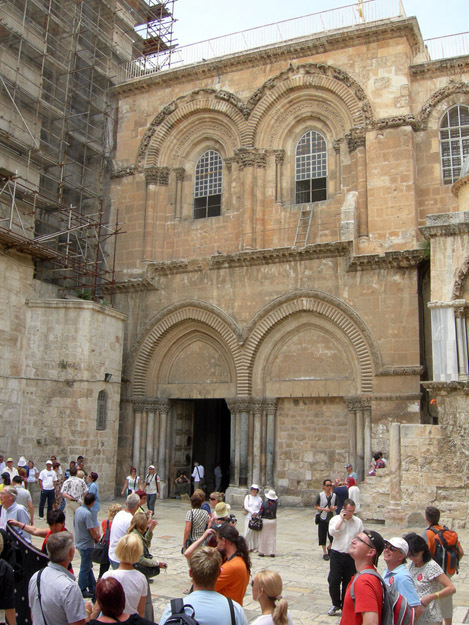 Any movement of the rock here will not be good news for the Church of the Holy Sepulchre. 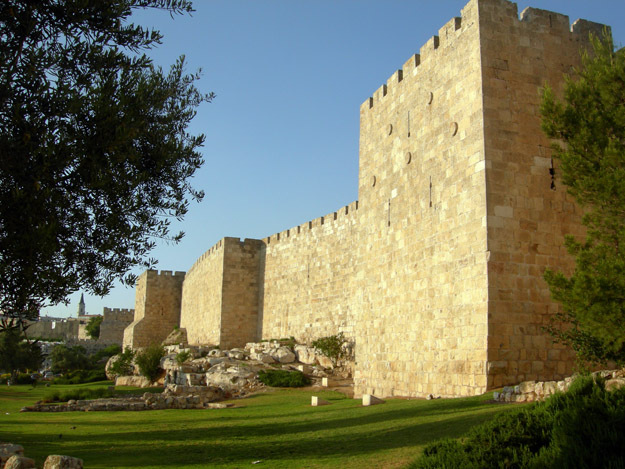 The "broad wall" is a remnant of an 8th Century BCE fortification built by King Hezekiah to expand the size of Jerusalem. 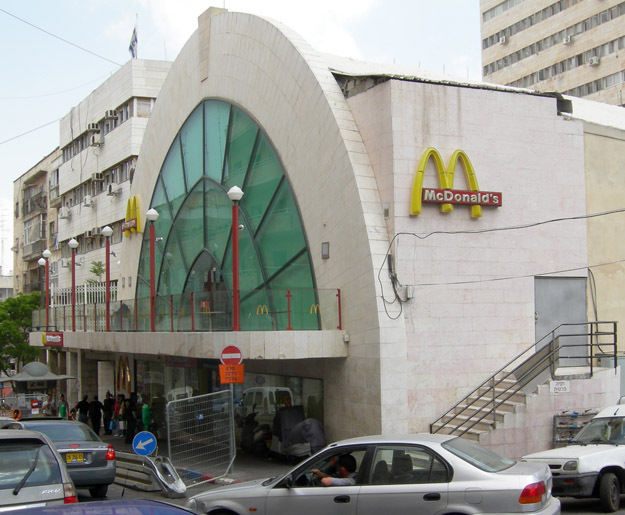 It was uncovered while Israeli engineers were clearing the debris in the Jewish Quarter after it was liberated in 1967. Jerusalem is indeed the “city of gold” when the sun rises or sets on it. The slanting rays give the beautiful stonework on the facings of its buildings a golden glow. 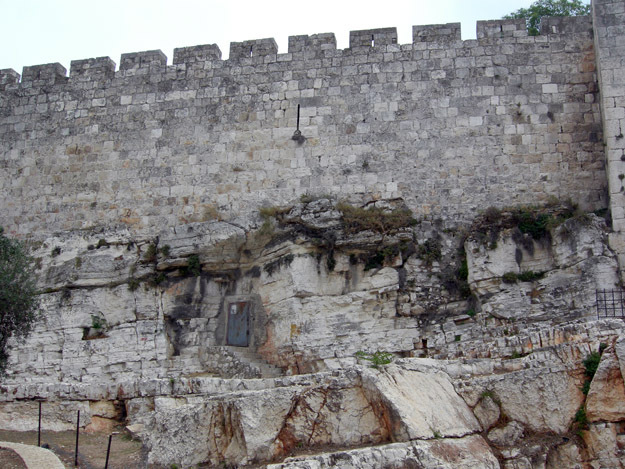 Since the British captured the city in World War I, it has been the law that all buildings must be faced with Jerusalem Stone, which is a mix of Late Cretaceous limestones and dolomites quarried in this part of the Judean Hills. City wall near the Jaffa Gate lit by the setting sun. The most beautiful and durable of the stone types is called meleke. 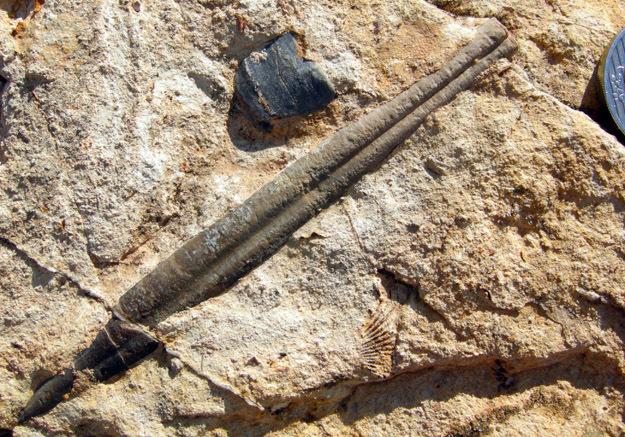 It is a Turonian (Late Cretaceous) biomicrite with numerous stylolites (jagged lines showing internal pressure dissolution), some trace fossils, and occasionally numerous molds of fossil mollusks. Close-up of the meleke variety of Jerusalem Stone. Finger is on a small stylolite. The local stone can be easily seen in outcrops on the north side of the Old City where the walls were built directly atop old quarry sides. The present quarries are now mostly in the West Bank and are very busy supplying stone for new construction throughout Jerusalem. 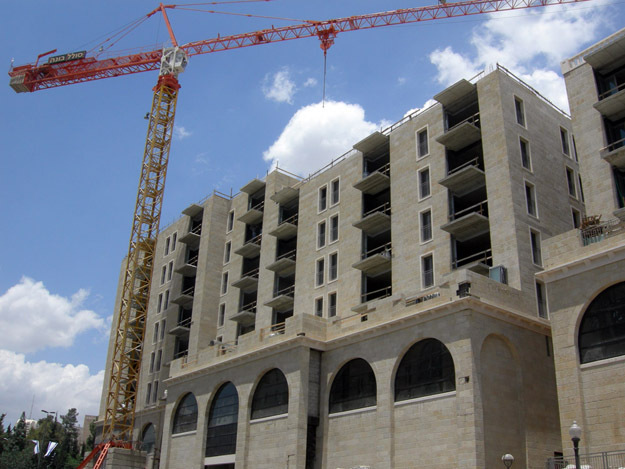 New construction in western Jerusalem using Jerusalem Stone. 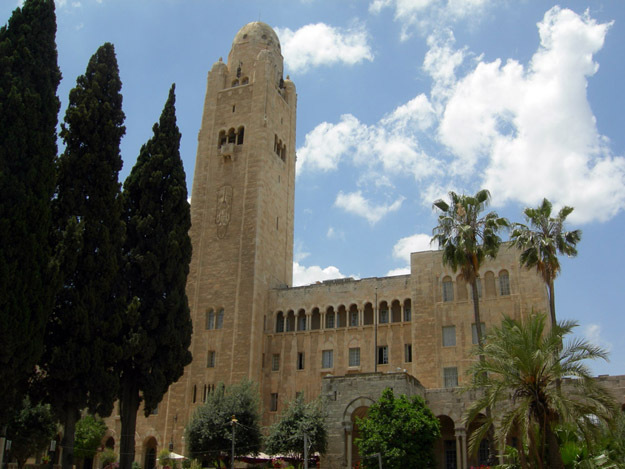 Here is a Muslim call-to-prayer recorded at noon in the Old City. There are several muzzeins calling at the same time from various minarets.